This page provides you with Lawyer resume samples that you can use for inspiration in writing your own resume, or for creating one through our easy-to-use resume builder. Below you'll find our how-to section that will guide you through each section of a Lawyer resume. Despite job growth for lawyers being level with the national average, it’s imperative for those in the industry to have a professional resume to stand out from the competition. Let us inspire you with our professionally designed attorney resume samples and path your way towards the job you have been dreaming of since you started law school: prestigious law firms and corporate companies are looking for a successful legal professional like you. Whether you want to work as a government lawyer on key influential projects or assist refugee migrants that need representation, you can use our lawyer resume samples to get you there: over 3 million other professionals have been reaching their career potential with VisualCV, so there’s never been a more perfect time to start. If you put as much detail into crafting the perfect lawyer resume as you would representing that important client on trial, you’d have firms throwing themselves at you to secure you as their legal representative. But with an average of 6 seconds spent per resume received, you’ve got to strike straight from the start: these legal firms have no time to waste! Use a clear font type like Arial when constructing your lawyer resume. Combine this with big headings and lots of white space to ensure it can be read clearly by potential recruiters. Then, follow the standard practice of exporting it in PDF rather than word: the result will make sure all of your information is in order when being considered by recruiting professionals in the law industry. You want the best attorney resume out there, and you are on your way to get it! This a section for showcasing your biggest legal wins and achievements. If you’re high experienced in developing detailed litigation strategies for individual cases or presenting watertight cases as an Attorney, be sure to make it count here. Professional and driven Attorney with 10 years experience developing creative case strategies for professionals in the entertainment industry. Proven execution of favourable outcomes in court cases, with strong application of trial research, legal document drafting and case delivery. Seeking to leverage professional strategies to work with Y company. Experienced Attorney seeking employment at X firm. Have successful track record of developing strong cases and arguing motions in front of jurors. Our resume builder can be used for tips and examples of how to construct the best lawyer resume. If you’re an entry-level or junior lawyer looking to gain more experience, use this section as an objective statement. This will allow you to highlight any transferable experience while also expressing your motivation to continue your professional practice. Professional and motivated entry-level commercial lawyer looking to implement academic legal strategies at Deakin & Levy, to provide in-house legal advice and support to network of clients. Proven successful application of compliance issue advice on small local business level, with hand in sales and purchase agreements and drafting disclosure letters. Seeking to leverage industry experience at national firm. Entry-level lawyer wishes to gain experience at Y company. Knowledge of providing legal advice and support to clients but no practical experience. Fast learner and dedicated to professional practice. This is your moment to showcase any niche experience you have within the field of law. Whether you’re a junior level commercial lawyer starting at your first firm or operate your own real estate law practice dealing with high-end developments, we can help you bring out the best of your work history. Have you opened up investigations from complains of retaliatory or discriminatory employment practices that have led to substantial company restructure? Have you prepared residency or naturalisation applications for a range of migrant clients? This is the time to make this information count! Start by listing the company name, your position and the dates you worked. Then, without overloading too much, highlight your professional achievements and tailored skill set for the job in question. 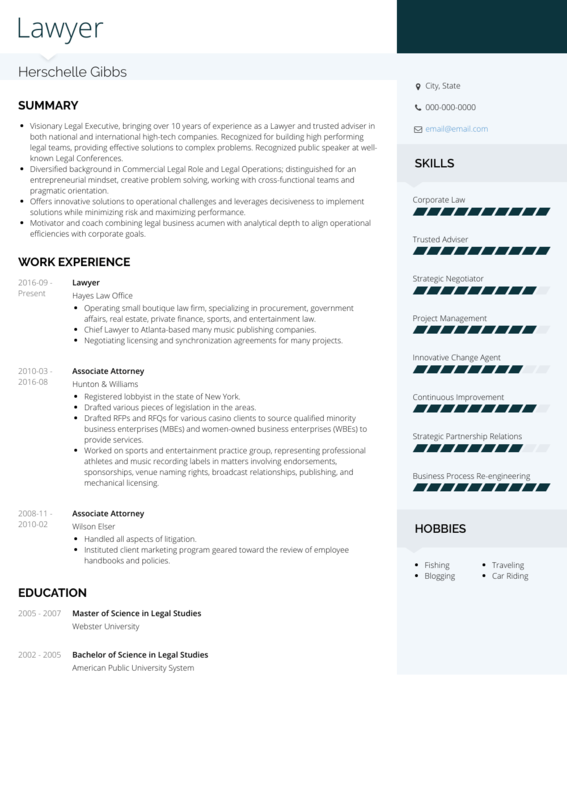 Lawyer Resume with no experience: If you’re a junior lawyer or fresh out of university, we recommend taking on some industry experience to help boost your work history section. Legal support apprentice work involving file admin, data entry and case administration is transferable experience that you should surely include - as is assisting attorneys with managing their caseload. If you need an extra boost, use our resume guide for information on writing your lawyer work experience section. Holding a ABA accredited law degree and practicing licence is integral for all professionals wishing to work in law, regardless of the specialism. Taking and passing the LSAT (Law School Admission Test) will ensure you can begin your tertiary experience, but extensive training and testing in specific doctorates will be requirement afterward. It goes without saying that all of the information included here needs to be truthful. If you’ve got gaps in your employment or are fresh out of university, you need to make this known. If you’ve got technical legal skills that fit the job role, you could be walking your way into a new gig. But getting them across in a professional manner isn’t always easy. You’ve also got to highlight your soft skills that show off your interpersonal skills. This following includes skills for an attorney lawyer. If you are looking for the perfect lawyer cover letter, you've come to the right place. Convince those prestigious law firms that you're the one they're looking for with our cover letter examples. Looking for that final touch? Our lawyer resume templates have been helping professionals just like yourself, so why not give them a try? Click here to make your life simpler with our CV templates!